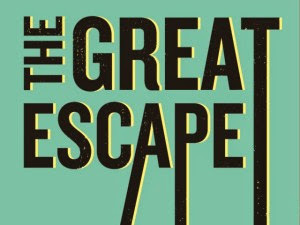 Following our exploits on day one at The Great Escape, we returned to windswept Brighton with renewed vigour. On day two, we took in more of The Alternative Escape, the set of unofficial gigs which runs concurrently with the main festival - providing even more exciting, new bands to catch. Hopping off the train, we head nearby to the Prince Albert and its tight upstairs room for Northern Ireland's Go Wolf. Despite appearing on a Kitsuné compilation, they're more funky than we expected - thanks largely to the bassline. They finish in fine form, with tracks like 'Even God' appearing. After a quick lunch with a local pal, we make our way over to the Pav Tav for our first Alternative Escape experience to catch the weird and wonderful Emperor Yes - at their usual energetic best. Our second attempt to catch Ballet School proves about as fruitful as the first - whereas late running stage times scuppered us first time around, a significant queue outside of Green Door Store stands in our way the second time. Not to say that we wouldn't have managed to get into the venue to catch some of their set but when there are plenty of other bands playing at the same time, why bother queuing? Gambling on being able to catch some of East India Youth, we rapidly stroll to the seafront before being presented with another queue. Curses. So (in an unexpected fashion) next up comes Jack Garratt over at the Killing Moon showcase at The Mesmerist, which is running a little/increasingly behind schedule. The enigmatic Garrett drops amusing quips in between his piano and drumpad playing, although we are not quite as enraptured by the music itself. We weren't really intending to catch Laurel - her obvious point of comparison being Lana Del Rey - but her set passed by in a not too disagreeable manner, aside from her dubious socks and sandals effort. With stage times now running an irritating 45 minutes late, we only manage to catch a few songs from pop purveyors Sons & Lovers, who had wowed us in a much larger setting at Southsea Fest 2013. They impress again in this tighter environment, although we'd actually argue they're one of the few acts to live up to any "stadium pop" tag provided. Rushing over to the Pav Tav again, we attempt to catch our faves Fight Like Apes - a fearsomely funny live act. Alas, we are scuppered by a large crowd, many of whom seen more intent on trying to chat through the set. Not wishing to sour our experience of both the band and the festival, we leave after a handful of songs. We do a similar thing for Marika Hackman over at The East Wing, who seems a tad nervous and inhibited in her performance - something that proved endearing at Bushstock 2012 but less so here. FEMME, on the other hand, is in full flow - particularly when flanked by her duo of backing dancers, the Bullet Girls. Her bold pop vibes particularly sparkle on 'Fever Boy' (as heard on recent telly adverts) and 'Heartbeat'. We leave to finish our evening off with East India Youth - who we'd earlier not managed to see. Unfortunately, he seems to be rather entranced by his own music, launching into an extended instrumental intro which loses dozens of the crowd within the first ten minutes. We don't last much longer as any kind of spectacle fails to materialise. So it might sound that our day has been a bit of a disaster but actually, we're quite satisfied. (Excepting the heinously late running of some stages.) Maybe it's partly the slight respite from the wind but equally, we've caught enough entertaining performances to fulfil our musical needs.